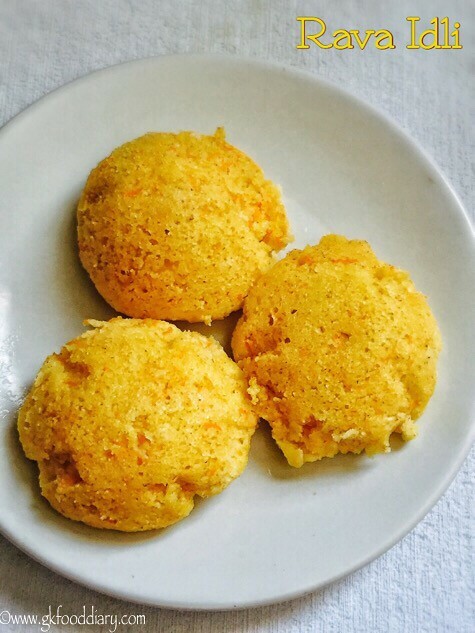 Instant sooji idli/Carrot Rava Idli – a quick, no grind, no fermentation idlis are made with carrots and sooji/ rava (cream of wheat). 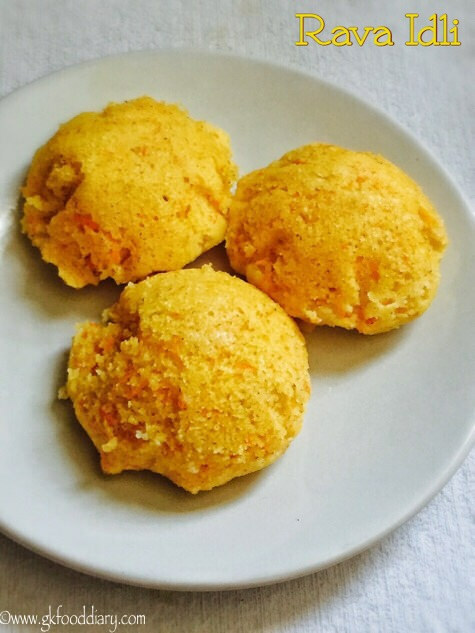 Rava idli aka sooji idli is a famous indian breakfast, tastes so delicious and its a nice variation to the usual idlis made with rice and urad dal. 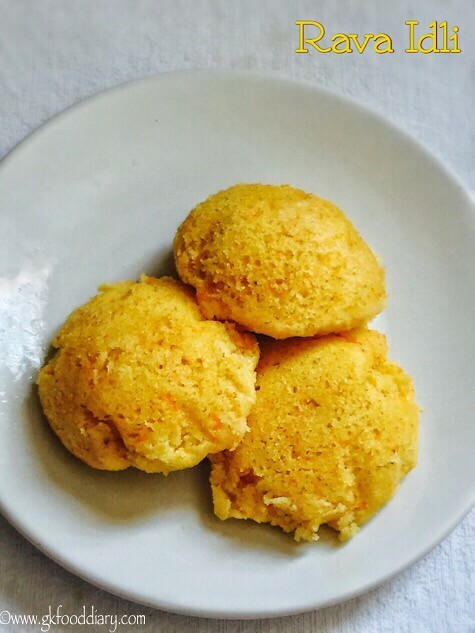 Rava Idli is my little daughters favorite and for the whole family too. 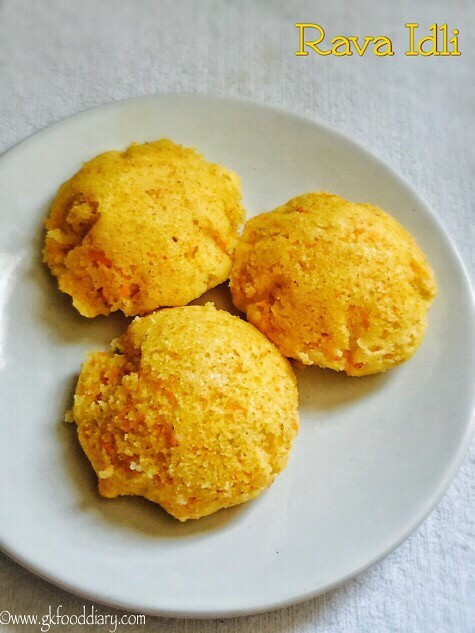 Rava idli is very handy to me especially when I ran out of idli dosa batter and want a quick breakfast.This rava idli can be given to babies after one year as a quick breakfast. 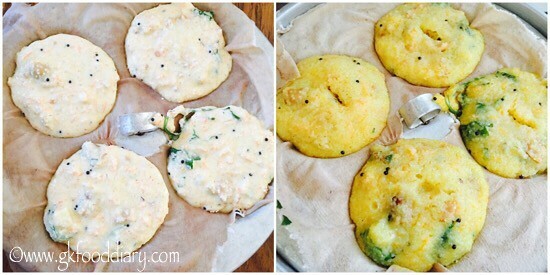 Now Let’s get on to check how to make this easy instant sooji/ rava idli recipe for toddlers & kids. Measure sooji/rava. Keep all other ingredients ready. Heat a tbsp of ghee in a pan , add cashews and saute until golden brown. Remove from the pan once done. In the same pan, add sooji/rava and roast it until nice aroma comes. Switch off the flame and cool it down. Grate the carrots, finely chop coriander leaves& chillies. Now in a pan, heat the remaining ghee and add the items to temper, once mustard seeds cracks, urad dal and chana dal turns brown, add hing. Switch off the flame once done. Now in a vessel add roasted sooji/ rava, curd, tempered items, chopped ginger, green chilli, coriander leaves(I didn't add) cashews, and required salt. Mix everything well. Adjust water to reach the dosa batter consistency that is neither too thick nor thin and finally add fruit salt/cooking soda/baking soda. Now start making idlis, pour the batter in each idli mold. Steam it with a cup of water for 10 to 12 minutes in medium flame. Check with a spoon, if it's coming clean, the Idlis are ready! Switch off the flame and remove from molds. 1. Measure sooji/rava. Keep all other ingredients ready. Heat a tbsp of ghee in a pan , add cashews and saute until golden brown. Remove from the pan once done. In the same pan, add sooji/rava and roast it until nice aroma comes. Switch off the flame and cool it down. 2. 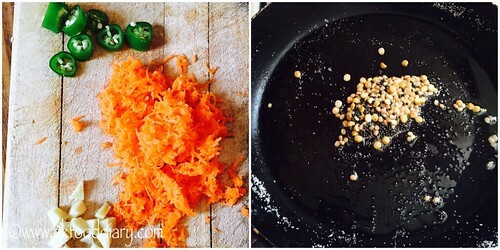 Grate the carrots, finely chop coriander leaves& chillies. Now in a pan, heat the remaining ghee and add the items to temper, once mustard seeds cracks, urad dal and chana dal turns brown, add hing. Switch off the flame once done. 3. Now in a vessel add roasted sooji/ rava, curd, tempered items, chopped ginger, green chilli, coriander leaves(I didn’t add) cashews, and required salt. Mix everything well. Adjust water to reach the dosa batter consistency that is neither too thick nor thin and finally add fruit salt/cooking soda/baking soda. 4. Now start making idlis, pour the batter in each idli mold. Steam it with a cup of water for 10 to 12 minutes in medium flame. Check with a spoon, if it’s coming clean, the Idlis are ready! Switch off the flame and remove from molds. The instant sooji /rava idlies are ready to serve! Serve it plain or tastes best with coconut chutney! For small babies skip whole cashews. 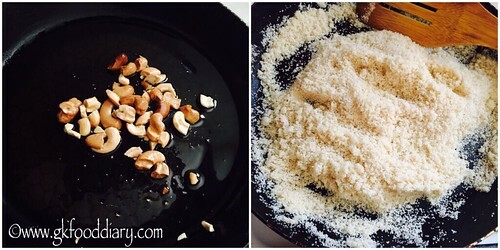 Instead use powdered nuts. For small babies, you can skip fruit salt/baking soda. Give at least 4-6 hours fermentation time once the batter is ready. That may give soft idlies without using cooking soda. You can also skip tempering items and green chillies for small babies. 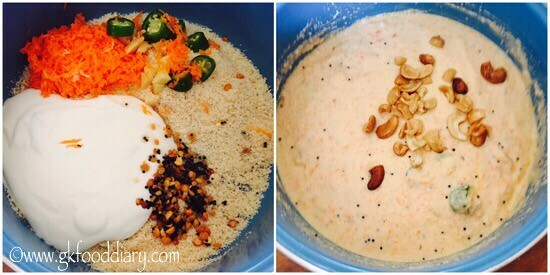 Make sure to introduce each ingredients separate to your baby, before you try this sooji/rava idli recipe. In this idli, can i skip curd, As my baby is of 9months old and suffer cough n cold. Or can u suggest some more instant idli options without curd for my baby.